The United States was built by a diverse, hard-working population, and Worcester’s newest café is paying homage to that “can-do” spirit by creating a place for people to gather and refuel along their own personal journeys. 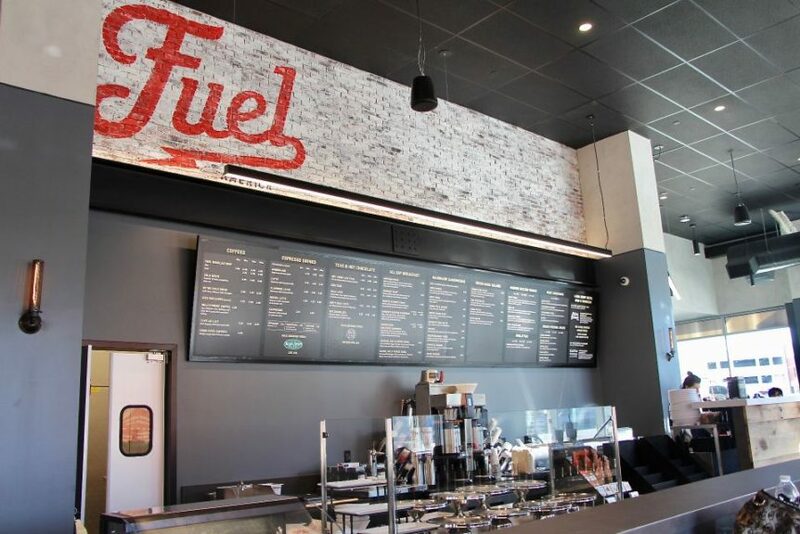 Fuel America is set to open in the downtown Mercantile Center early next month, becoming the Waltham-based chain’s third location. The 5,000-square-foot space at the corner of Front and Mercantile streets features a full roastery and café, and will also serve beer and wine. Fuel America opened its first location in 2012 near Boston College and later added a second spot in Logan International Airport. Bonasia said the company was attracted to Worcester not only for its affordability, but also because of the city’s up-and-coming feel. He said the café is hoping to attract everyone from college students to the nearby medical community. Bonasia and one of his three business partners, Rick Vallarelli, came up with the idea for the coffeehouse in the late 2000s, as the United States was coming out of a recession. “Americans were kind of bummed out. We wanted to create a place people could come that was diverse and not pretentious,” he said. The Worcester location has a robust, all-day breakfast menu and will serve wine and beer from Flying Dreams Brewing Co. The two companies have already developed a Fuel America Coffee Stout together. “We’re in an area where a lot of people work, and it would be great if people come here after work and relax,” Bonasia said. The location will also serve nitro cold brew coffee, espresso drinks, cold pressed juices, smoothies and Bulletproof coffee – made with a combination of healthy fats – among other offerings. Its food menu was also inspired by the “melting pot” concept, featuring sandwiches like the North Ender, made with ham, salami, hot relish, pesto, spring mix and lemon vinaigrette, and the Mayflower Turkey and Cheese, made with turkey, cheese, spring mix, chunky cranberry spread and her mayonnaise. The shop features a mixture of modern furniture and vintage accents, including aviator chairs and black and white photographs for Americans in the early 20th century. The café also sources many of its products locally. All of its milk and cream comes from High Lawn Farm in Lee, and the Worcester location will also sell KrafTea Kombucha and a number of products from the Boston area, including MEM Tea and Taza chocolate. Fuel America will also move its production facility to Worcester, where customers can watch the roasting process through large glass doors. Its coffee beans are currently sold in Market Basket supermarkets. Bonasia said the coffeehouse will also hold tastings and other workshops in the new space. The concept was inspired by Starbucks’ roastery in Seattle, which the Fuel America owners toured while attending a conference several years ago. “There isn’t anything like it in Worcester or Boston,” he said. An opening date for Fuel America hasn’t been finalized, but will likely be early next month. The location will employ about 30 people. “Worcester has gone through some periods that have been rough, but it’s on the comeback now and (we’ll) be part of that resurgence,” Bonasia said.